The Pyu Ancient Cities comprise the archaeological remains of a group of city-states, founded as part of the southward migration by the Tibeto-Burman-speaking Pyu people. Their cities of Halin, Beikthano and Sri Ksetra are stretched out alongside the River Ayeyarwady. Villages tending to irrigated fields gradually led to the emergence of urban areas around 200BCE. The settlements were fortified and central palace citadels were constructed. 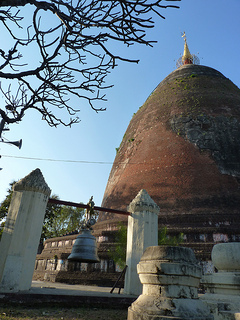 The Pyu culture was heavily influenced by trade with India, importing Buddhism as well as other cultural, architectural and political concepts. Each of the cities had extensive monastic quarters. Myanmar’s very first WHS came as a surprise in 2014: few will have visited one of the Pyu Ancient Cities before its inscription. History wise, it is not an illogical choice however. The Pyu were the first of the civilizations that settled along the Ayeyarwady River, in what is the heartland of current Myanmar. They started building city-states here from the 2nd century BC on. They came from the north (the Tibeto-Burman plateau or India) and brought Buddhism with them. None of the three Pyu cities Halin, Beikthano and Sri Ksetra lie close to the main tourist destinations in Myanmar. While I was staying in Mandalay, I hired a car plus driver and guide for the day and went for Halin. Though only 95 km, the trip took us 2.5 hours. We found our way out of the busy streets of Mandalay, and then passed the lovely Sagaing with its numerous gilded stupas. Afterwards it’s a long haul northwards in the direction of Shwebo. The guide had been there once before, but they do not make it out to Halin often. So driver and guide took some time asking around for the right turn-off. It turned out that there is a huge sign pointing to the World Heritage. From that sign it’s another 17 km on a semi-paved country road. We had to stop several times to let cattle and goats pass. Halin was and still is a major agricultural area, the land made fertile by irrigation. You’ll mostly see rice paddies (they export rice to China! ), but also sesame is grown here. Arriving at Halin and passing the hot springs in town we went straight for the Archaeological Museum. Here you have to pay the 5,000 kyat entrance fee (3,50 EUR). In return you get a ticket and even a folder in the English language. My name went into the visitor book, that showed that a number of people do visit each day – mostly from larger towns in the region such as Shwebo. The museum itself houses about 10 glass cases with objects found at Halin. A lot of pottery, but also series of decorated pipes and an ornamental candle holder with space for 4 candles. 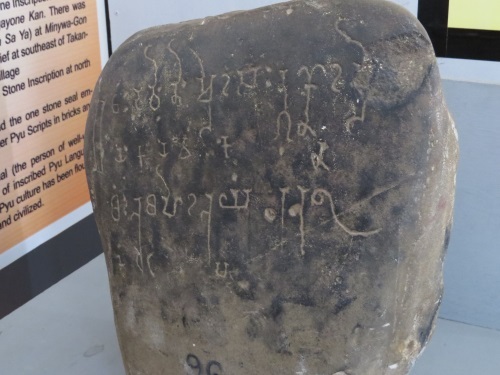 A stone slab shows inscriptions in Pyu writing, a script with elongated characters that is different from the contemporary Burmese. After the museum we went back into the car to start the circuit around the archaeological site. Because it stretches over several kilometers a car (or motorbike) is necessary. These are essentially still farmlands, and the Pyu findings have been singled out and are “protected” by circles of cacti. Like the other Pyu cities, Halin was surrounded by a city wall. 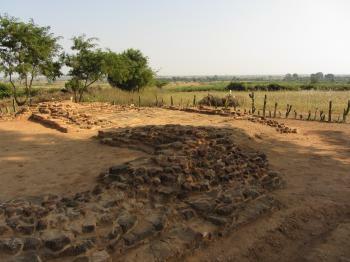 Parts of it have been excavated, and also some of the entrance gates. The Eastern Gate was our first stop, two rows of bricks with a bend at the corners. The other remaining gates looked pretty similar. Traces of stupas or monasteries also have been found, their ground plans can still be distinguished. All single locations have a unique number, and boast an information panel with explanations in Burmese and English. More spectacular findings are kept in a covered building. Both pottery and human skeletons are left in situ in the layers where they haven been discovered. A previous reviewer might be comforted in the fact that it’s not possible anymore to step into these graves and possibly damage the bones. Outside that building we found the one and only Halin souvenir hawker! He even was selling Halin WHS T-shirts, quite a collectors item. We there also met with a government official who came after us and wanted our names & passport numbers. He apologized for the poor outfits of the staff (“we don’t even have uniforms”). A woman from the museum went ahead of us on her motorbike to the last 2 sites, ones that have to be opened up with a key. They are a collection of stone slabs, inscribed with mostly Burmese and some Pyu texts, and another graveyard. My guide said that despite Halin’s WH status, he does not think it will ever attract many tourists. He is probably right, low heaps of brick in farmland will get few people excited. There still is not much known about the Pyu, I believe that more research would make a better-selling story. Going out there to see how rural Myanmar lives I found certainly worth the trip. It reminded me of Mahansthangarh TWHS in Bangladesh. 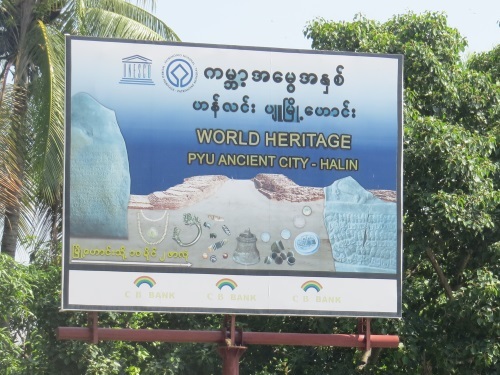 Halin seems to be the least interesting of the 3 inscribed Pyu cities, with Sri Ksetra being the main site. ICOMOS could even not find enough justification for the inscription of Halin, while they saw sufficient in the other two cities. Their report on the three sites was pretty harsh in general, and Deferral was advised. They were especially reluctant of accepting the view that the Pyu cities had served as role models for Angkor. The ICOMOS advice was overturned during the disorderly 2014 WHC session where at some point each site got in no matter what the Advisory Bodies had suggested. So here we are with the three Pyu Ancient Cities, recognized for the spread of Buddhist urbanism across Southeast Asia, testimony to the past Pyu civilization and innovative urban planning. Dr, Tin Maung Kyi, M.B.& B.S., M.Sc. I have been to Halin, 2oo9. Archeology-that many writers wrotes. This is a right spot that UNESCO had chosen. But there are many things to learn /study here- ceramic tiles and Kilns, (now obsolete), Sardaw Oak's (the King's overseer of salt production) his house where no nails were used and built over a hundred years ago, salt export to Western Yunnan, Snake cult, Manipuri invasion, mud pots and mud volcanoes,hot springs, Japanese occupation period, Four layers of inhumatioon, Jormon pots (earliest pottery)etc. etc. There will be no end to learn. I visited this WHS in December 2012. I passed by Halin and Beikthano and decided not to visit due to time constraints and since I had seen quite a number of temples and brick ruins during my 3-4 week visit in Myanmar. Luckily however, I decided to stop and visit Sri Ksetra or Tharay-khit-taya. The main highlights of my trip were the stupas that could be seen at the 4 corners of this large ancient city, one of which was proudly described as "having the shape of a woman's breast". Now that Myanmar has its first WHS I sincerely hope that other sites will follow. Myanmar is a beautiful country and one of its main assets are the wonderful and kind people that live there. While in Mandalay in December 2013, I felt compelled to visit the remote archaeological site of Halin, as it seems likely to be Myanmar's first inscribed site during the convention in 2014. Had this not been the case, it would be inconceivable to spend a day travelling out to this location, through extremely rutted 'roads' that are normally limited to motorbikes and ox-carts. The local archaeology department certainly believes that it will be inscribed, and probably the most fascinating aspect of the visit was seeing the site staff in 'UNESCO preparation mode'. A museum was being literally built in front of us, with the small existing part filled with artifacts in plastic bags. Staff were categorising them with photos, and assembling a large table-map of the area. They seemed a bit flustered to have foreigners barging in, but happily charged us for a $5 entrance ticket. An English language brochure was supplied, with 'UNESCO nominated world heritage list' as the initial heading. This was obviously new, as was the English language signage on the building. 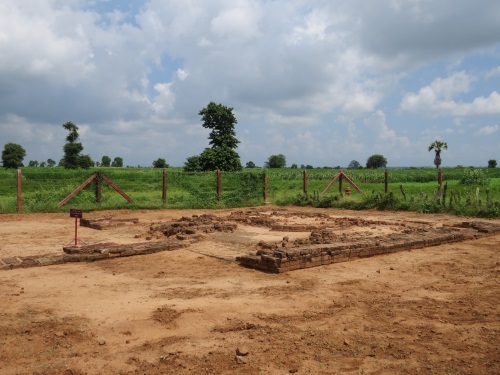 The actual site is spread across a large area of peanut farms, with a few dozen specific areas of excavation. These are not impressive ruins like more famous ancient cities or temples, but instead foundations of walls and monuments, slightly rebuilt to about knee height. This is not to say they are not interesting, but do not expect to be awed at first glance. More shocking were the sites of human burials, but not for the correct reasons. Archaeologists were working in these sites, noting meticulously in English while trying to ignore our intrusive presence. Unfortunately, they ignored our guides insistence that we go down into the actual pit, where we were handed bronze spearheads and actual bone fragments! Picking up such things for touristic handling is something I would never do of my own accord, and being pressured into handling them was surprising and uncomfortable. Worse, in wandering around the pit, the guide stepped onto a human armbone, from somewhere between the 4th and 9th century, and crushed it beneath her feet. She didn't seem to notice. Overall, it was a worthwhile day, but I'm not sure I could recommend it once the novelty of UNESCO-related scrambling to be a 'proper' tourist destination dies down. Hopefully by then more sensible rules can be in place regarding access to the dig sites. Archaeological potential: "The three cities are partly excavated archaeological sites"